Mildred I. Ayers, 93, a resident of Chester Township since 1968 and formerly of Kirtland, passed away Sept. 7, 2014, at Lake West Hospital in Willoughby. She was born Sept. 17, 1920, in Thayer, Ill.
She and her husband vacationed at Hobe Sound, Fla., from 1973 to 1993. 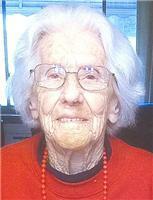 Mildred was active at West Geauga Senior Center and volunteered at Hillcrest Hospital. Survivors are her children, Kathleen (Ted) Moss and Ron (Bonny); grandchildren, Christine (John) Powell, Nicholas Trivisonno, Mickey (Veronica) Jaramillo and Brett Ayers; and several great-grandchildren. She was preceded in death by her husband, Irvin W.; sisters, Mina Peters, Alice Rae and Bessie Boddy; and brothers, Cleo, Elmer, Frank, Chester Barstow. Funeral Service will be held at 11:30 a.m., Friday, Sept. 12, 2014, at Western Reserve Memorial Gardens Chapel, 11521 Chillicothe Rd. Chesterland, OH. Burial will be in Western Reserve Memorial Gardens, Chester Township.